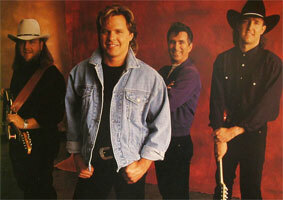 Groupe Country US formé en 1990 et comprenant Jeffrey Steele, Cary Parks, Larry Parks et Hugh Wright. Boy Howdy was a contemporary country-rock band who formed in Los Angeles in 1990. Their primary influence was Little Texas, though one could catch bits of the Eagles and CCR in their sound, and they frequently covered classic rock tunes as well. Vocalsist/bassist Jeffrey Steele had previously recorded as a solo artist, and under the guidance of Dwight Yoakam producer Pete Anderson, he contributed the song "Driftin' Man" to the compilation A Town South of Bakersfield, Vol. 2. Brothers Cary (guitar, mandolin) and Larry Parks (guitar, fiddle) were the sons of bluegrass fiddler Ray Parks, and the former had played with Randy Meisner (Eagles) and Rick Roberts (Flying Burrito Brothers) before hooking up with Steele at an L.A. club. Also present at that gig was drummer Hugh Wright, who completed the lineup. Their first single was 1991's independently released "When Johnny Comes Marchin' Home Again," which proved locally popular thanks to the Gulf War, and helped land Boy Howdy a deal with Curb. Their debut album, Welcome to Howdywood, was released in 1992, and the group went on to appear in George Strait's film Pure Country that year. Tragedy nearly struck when Wright was hit by a car and spent five months in a coma; fortunately, he recovered, and rejoined the band in time for their breakthrough, 1994's She'd Give Anything. Even though it was only a mini-album, it produced two Top Five country singles in the title track and "They Don't Make 'Em Like That Anymore." 1995's full-length, Born That Way, didn't quite duplicate that success, however. 1992 CD CURB 76905 (US) . Our Love Was Meant To Be / ? 1993 CD CURB D-1066 (promo) (US) . She'd Give Anything / ? 1993 CD CURB ? (US) . A Cowboy's Born With A Broken Heart / ? 1993 CD CURB ? (US) . She'd Give Anything / ? 1994 CD CURB 76934 (US) . True To His Word / ? 1994 CD CURB ? (US) They Don't Make 'Em Like That Anymore / ? 1995 CD CURB 76940 (US) . Bigger Fish To Fry / ? 1995 CD CURB ? (US) . She Can't Love You / ?